This is a list of certain main groups of beings along with terrestrial species. Martial, medical, musical and other orders which do not play major parts in the Chronicles may be mentioned but otherwise do not figure in the histories. CHERUBIM--an order of the first magnitude, residing in the First Heaven; four in number; exquisite, winged, four-winged beings of greatest created intelligence and power; two never touch ground of any sort and constantly watch over events in the Universe; the third, Uran, acts as the Supreme Court of the Universe. The fourth, Lucifer, whose name meant "Light-Bringer," was Keeper of the Stones of Fire and communicated things no lower being could understand; the fourth became haughty and proud and before he could "reform" the Universe according to his scheme was confined to Earth, the twin planets known in the Chronicles as Earths I and II. 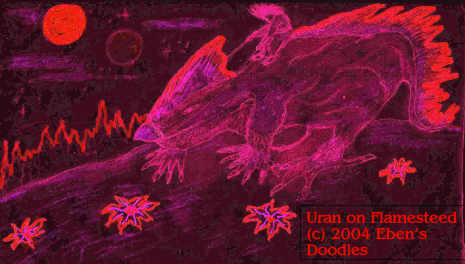 The Uranian cherub’s favorite stars of residence were those of Ara, "The Altar," one of the most southerly constellations. They are said to be the place where forces opposing Lucifer formed an alliance and conceived the strategy that defeated the Titans and their Cherub leader. The majesty of the Cherubite spheres is unconceivable. The Cherub Uran is said to be fond of riding about his domains on a "flamesteed," a gigantic beast formed of more fire than flesh. For a physical description of the elusive Cherubim and the Uranian Cherub's particular contribution to equity in the Universe, see the later Chronicles. 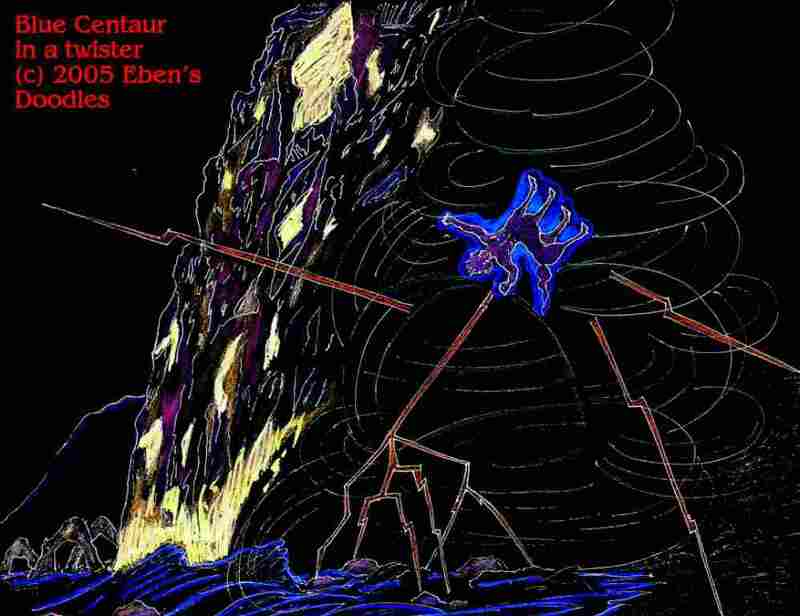 TITANS--an order of the second magnitude, residing in the Second Heaven Lucifer aspired to create; a terrestrial lost to volcanism and the eruption of subterranean gas chambers on both planets. Nearly all the remaining Titans were taken away bound to the Underworlds. Surviving human beings moved from Mukalia in the Pacific Ocean to adjacent continents. As the Pleistocene gave way to the Holocene, Lucifer, pining for lost splendors, built up Atlantis I and II on the planets with the remnant of Titans. On each Earth, Atlantis was an island continent in what would be called the Atlantic, and he meant it to rival the old Mukalia as much as possible. 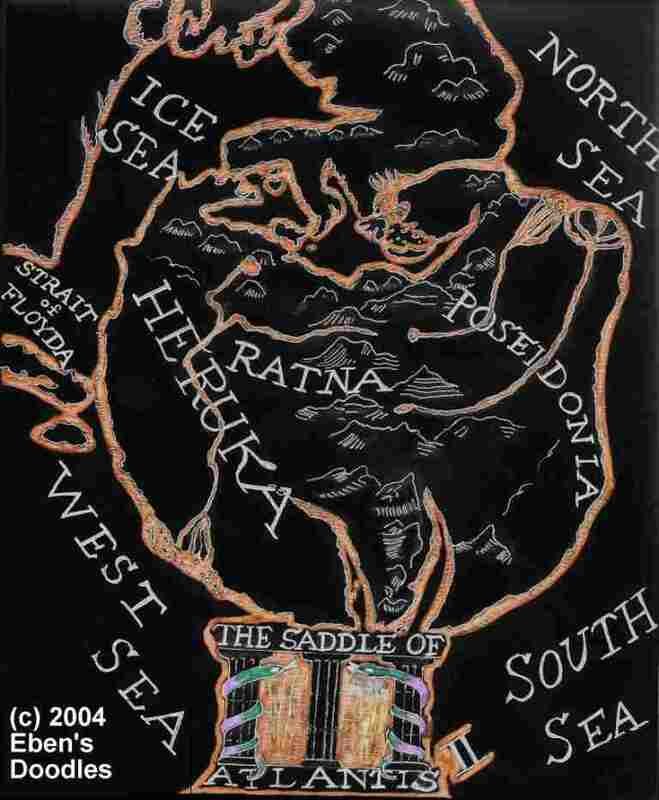 On Atlantis, the intermarrying of humans with Luciferian creatures produced monstrous progeny and great injustices through abuses of Atlantean power; the twin island continents of Atlantis was sunk after 10,000 B.C. on both worlds by earthquakes and subterranean volcanism provoked by tectonic plate shifts. The destruction and submergence of Atlantis took place just before the Land Bridge was obliterated. 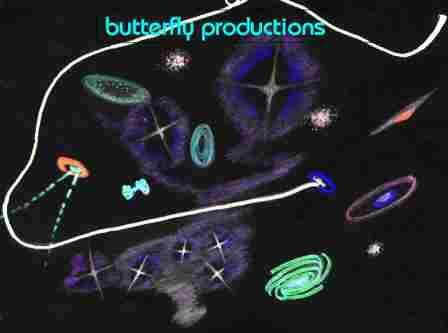 As a minor and rather late incident in the War of Heaven, the planet Earth I was then separated from its twin and their inhabitants soon lost all knowledge and memory of each other. Finally, any mention of the Titans must at least describe their foundational role in modern human history and religion. Even with Luciferan meddling, the Mukalian civilization was essentially Titanic. Atlantis, which was a Luciferian-Titanic-human offshoot of Mukalia, followed late and was short-lived in comparison, ending after 10,000 B.C with the submergence of Atlantis and the separation of the Twin Planets. Atlas the Titan is said to have played a major role in the separation. After that we hear of him no longer, so he must have been cast down into the Underworld, whether Earth I or II’s, it is not known. On both planets, the demise of Atlantis inaugurated the Modern Age and the birth of classic, "benchmark" human civilizations patterned somewhat after Atlantis. After the “Golden Ages” of Mukalia and Atlantis, fully human states took precedence, beginning with the Old Kingdom of Egypt, the city-states of Sumer, and the Indus River civilization, cultures which are mistakenly called "ancient" by academics to this day. But the Titans, even after their disappearance, continued to affect human society most powerfully. Titans acting as overlords of Mukalia and Atlantis have come down to human society as the so-called Olympian gods of Greece. Other nations used differing names for the same Titans. Much of the Greek account of them reads quite childish and whimsical to an adult reader, but the Titans were quite godlike as compared to humanity. Chronos, Rheia, Zeus (Roman: Jupiter), Prometheus, Poseidon, Apollo, Athena, Hercules, Ares, Perseus, Hermes, Hera, Demeter, Artemis (Diana to the Romans), Persephone, Hades, Aphrodite, Dionysios, Hyperion, Ophion, Eurynome, Themis, Mnemosyne, Okeanos, Koios, Maia, Clymene, Calypso, Iapetus, Astraeus, and many others were all Titans. The Greeks, thinking them gods or, as in the case of Hercules and Dionysios, part human and thus semi-divine, passed on all we know of the terrestrial Titanic race. They worshiped all the Titans, more or less, despite their very conspicuous loss and corruption of intellectual and moral fiber. But the Greeks were too clear-eyed to gloss over the faults and flaws of anyone, even if he seemed a "god". Since the Titans' decay could not be overlooked by Greek worshipers, the whole pantheon of Titanic "deities" eventually began to fade out of both Greek estimation and culture as time went on. It was one thing to take a flawed "god" with a grain of salt, but when the salt poured? The chief poets and playwrights were quick to point out Olympian foibles, rivalries, and immoralities. The Titan gods' more shining characteristics, which had awed less sophisticated Greek citizenry in earlier times, could not save them from withering scorn and laughter. By the time of Christ, however, Greek tolerance and incredulity waned to the point where educated people no longer held to the Olympian gods as genuine divinities. Gods, for purposes of state, came back into human society only when imperial rulers were deified by the Roman Senate. But, unlike the depraved Nero or Caligula or the aptly named Commodus who fooled nobody into genuine worship, the Titans of Mount Olympus had once been worshiped on the Twin Worlds. Perhaps that was their undoing, as they became very prideful and arrogant during the last millenium of their domicile. Mistakenly thought to be divine, later quarantined and confined out of sight and underground, they still remain far too much a part of human culture and literature to be ignored or forgotten. 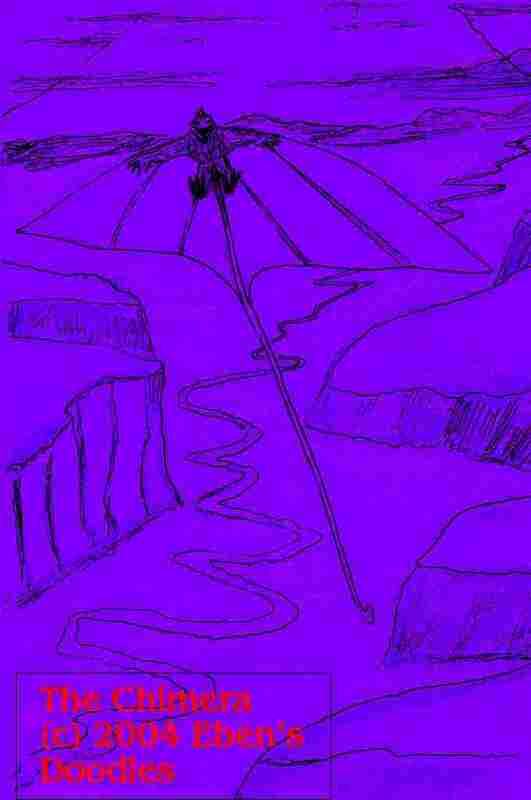 And should humanity forget, there survive here and there on the Earths archives of lost Atlantis. Not all Titans roamed free--for Hades was a prison for some of the worst from early on. Prometheus was imprisoned somewhere in the Caucasus Mountains, later set free by Hercules, the Greeks said. But actually he never left Hades after being thrown there and chained to the granite rocks. Would Percy Bysshe Shelley ever have championed him in his poem if he had seen how truly wretched (deservedly so) Prometheus was in Hades? GEMINI--an order of the third magnitude, residing in the Third Heaven; also called the Tyndaridae, or Heavenly Twins, sons of Leda; this order of uniquely paired beings did not fall with the Titans in either the first or the later skirmishes of the War of Heaven, but various members became increasingly involved with the losing side after Lucifer was quarantined to Earth I and, later, his Titan adherents to the Underworld. 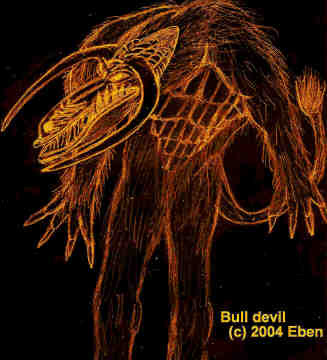 The onset of the fall of certain Gemini can be traced to this affiliation with the peculiarly tandem, host-parasite species called the Algol inhabiting the so-called Demon Stars in the Perseus Constellation. According to the prophetic Revelation of St. John the Divine that concludes the Bible, after the second coming of Christ humanity will judge angels. Among those angels to be judged may well be the Geminus, Pollux (or Polydeuces), by whom the title of Earth II was transferred to the Algol (see the Donation of Iskander in the Appendix, Vol II). Just as the Greeks called the Titans gods, when they were not, the Gemini were called "angels" or heavenly messengers. In Greek legends, Kastor was the patron of horsemanship, Pollux his twin of boxing fame. Pollux, most significantly, was supposed to have a "divine father" such as a Titan, but Kastor, though born of the same mortal mother, did not; therefore, Kastor was the weaker of the pair and was fated to die. It took his brother's devotion to raise Kastor to heavenly status after dying like any mortal. In the same legends, the twin Gemini took turns above and below on Earth. In astronomy, Kastor the star is a most remarkable system of binaries containing at least six stars; together the Kastor binary star system has a magnitude of l.6 and is sixteen light-years from Earth. The binary star system of Pollux is of the first magnitude and is a mere thirty three light-years from the star system and planet of Earth; both star systems of Kastor and Pollux are visible to the naked eye in Earth I's north-polar hemisphere. 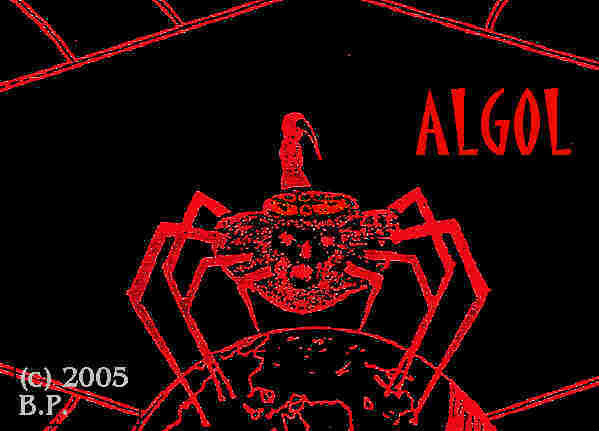 ALGOL--a terrestrial species of the fourth magnitude, residing in the Fourth Heaven; also called Ghouls, Shadows, Gorgons. The Gorgons--three in number by the names of Medusa, Stheino, and Eryte, fathered by Rhodamanthus, a half-human, half-Titan on an Atlantean priestess adept in the worst vices of black magic; hermaphroditic, they spawned other lesser, monstrous creatures. Though possessing beautiful human female faces, the Gorgons' hair was composed of vipers, their hands were eagle-like claws, and they were infamous chiefly for a strange and terrible psychic power. By staring at their victims, they could tramatize to stone anyone who was so foolish as to dare to look them in the face. They reside in the Perseus Constellation, in a star system called Algol, or Head of Medusa. It was not by choice. In a second, terrestrial campaign of the War of Heaven, about 10,000 B.C., Medusa the Gorgon, residing on Earth and Kastor, was slain by Perseus, a loyalist terrestrial Titan. He cast her head into space, and legend says it ended up on Wormwood, one of the very hot planets of the binary star system called Algol. Her sisters were driven into exile on the same planets. Algol is also the second brightest star, actually a binary, in the Constellation of Perseus. A variable double star, its fluctuations can be observed on Earth I with the naked eye though it is 100 light-years from Earth. Its two stars revolve around each other in 2 days, 20 hours, and 49 minutes. The brighter of the two stars is 100 times brighter than Earth's sun, making it a supergiant star. When the darker star moves in front of the brighter one, a dimming takes place. This decline in luminosity by a factor of about 3 is clearly visible on Earth. The two variable stars comprise "Medusa's eyes." The one in the right eye is Algol, the Demon Star. CENTAURI--a terrestrial species of the fourth magnitude, originally residing on both Earths; known on the twins as destructive monsters but also in some cases as highly intelligent and wise mentors, aiding Titan or human heroes such as Achilles and the Argonaut Jason; the violent and immoral majority of Centauri grew corrupted long before the half-human, partly Titan, and largely Luciferian civilization of Atlantis. An account has Hercules, who was mixed Titan and human, destroying many with his poison arrows when they attacked him at the cave of Pholos the Centaur, a friend to Hercules. Some names of the centaurs slain by Hercules translate from the Greek as Bristler, Hit-for-Hit, Eye-for-Eye, Tooth-for-Tooth, and Blackmane--meanings which betray the Centaurs' characteristically cruel, fighting, unforgiving, violent natures. Nessos, also dying by Hercules' poison arrows, is posthumously credited with Hercules' "death," though it is hard to understand how an expired centaur's blood might be so toxic it could kill a Titan on contact. Rather, it is quite likely Nessos knew something about poisons (or knew someone who did!) and, while still alive, disfigured Hercules with a particularly virulent herb or yeast infection. Despite Hercules's rough treatment, many Centaurs fought as allies of the Titans and fell with them at the time of Mukalia's end; a remnant survived to gain entrance into the Atlantean civilization, but they did were not popular with neither Titans nor the people and were attacked and driven into the mountains. Finally, they were imprisoned in the Underworlds. The Constellation of Centaurus, visible to the naked eye on Earth in the south-polar hemisphere, contains Alpha Centauri, the closest star to Earth and also the third brightest of all stars. Its distance from Earth is 4.35 light years. Actually a double star, Alpha and Beta Centauri link with a distant companion, the much smaller star Proxima Centauri which circles around both Alpha and Beta. Despite the dismal record of the species, the Centauri remain most difficult to classify. Is it an order of monsters or magnificence? Chiron was not a monster, and he definitely was magnificent. To do him honor, he is placed forever among Earth's stars as the Constellation Sagittarius, the Archer. This constellation contains two navigational stars, Nunki and Kaus Australis. The noteworthy splendor of this part of Earth I’s sky comes from the position of Sagittarius as it points toward the billions of stars clustering at the heart-center of the Milky Way. Also, see the Star Map for Earth II (Appendix) for the Blue Centaurus Constellation. The centaur for which the constellation is named, Chiron, is connected in the Chronicles with yet another Constellation, or rather, a nebula called the Black Crystal Nebula, and there is a brief encounter between this Chiron and a human fallen into the Underworld. 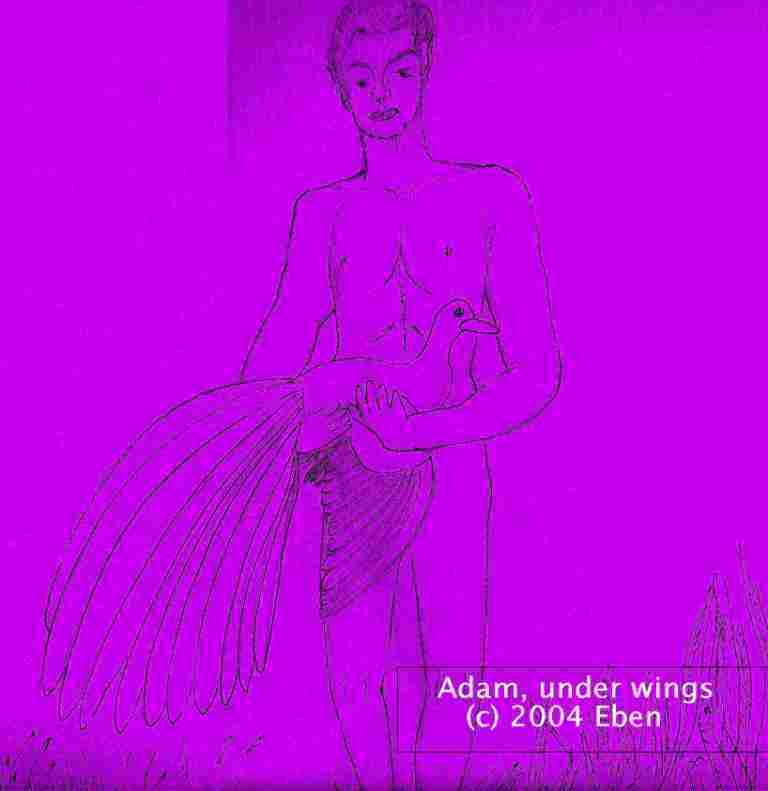 ADAMIC--a terrestrial species of the fifth magnitude (given the image of God, however, this species actually enjoyed a position superior to the Cherubim’s), residing in the Fifth Heaven; inhabiting the twin planets of Earth; with the fall of this race, corrupted by the renegade Cherub, Lucifer, came much grief and unhappiness. Perhaps it is his fault that this is the only higher species that cannot keep itself alive. Failing to eat of the offered fruit of the Tree of Life, they ate fruit instead of the Tree of the Knowledge of Good and Evil, the one tree forbidden to them, despite the divine warning they would die if they ate of it. The Creator, known to Adamic people as Almighty God, sent His Son, called the Christ or Annointed One, to become Adamic at least in body and soul in order to restore the Adamic race, body and soul, to its original, immortal state (this account is given in the New Testament). 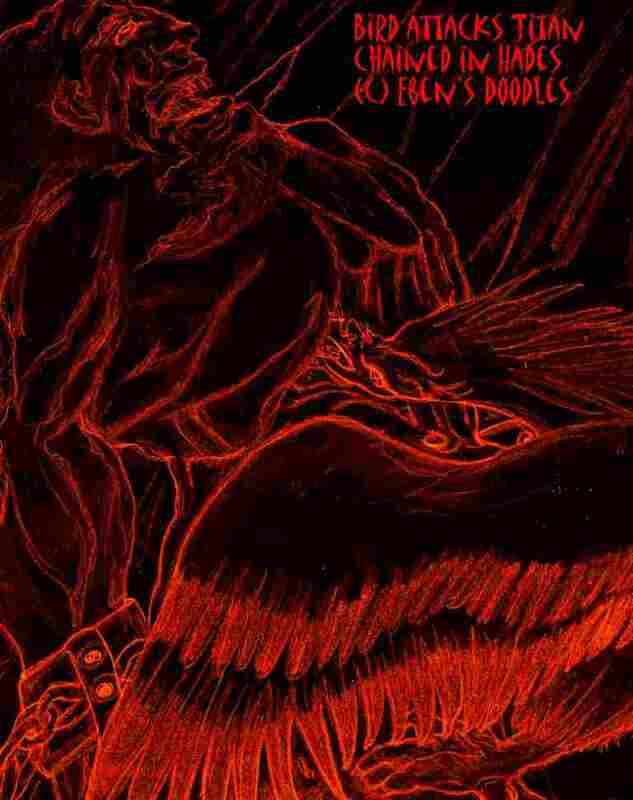 Though confined to Earth, Lucifer continued with his rebellion, seeking to stop or pervert such a restoration, for to him it must have meant the total, eternal loss of his influence and dominion over last vestige of his empire. The Cyclopes--one-eyed beings that were half-Titan, half-human, and giant in stature; spawned by corrupted Titans, or some say between Gorgon and human partners, they lived alone, as most monsters preferred to do, in reclusive retreats in the mountains, herding huge flocks of goats and sheep for their food. They survived on the Twin Earths even after the initial outbreaks of the War of Heaven, but were eventually killed off by humans after the destruction of their motherland, Atlantis. Men coveted the Cyclopes' gold hordes and large herds of stolen sheep and found even so fearsome a monster easy prey once its single eye was jabbed out. Other monsters, perhaps more formidable, were Typhon, the Chim or Chimaera, and the mariner's special terrors--Sylla and Charybdis, and the Sirens, beautiful witches who sang from a rocky shore and were so irresistable they could draw ships to doom on the reefs. To save himself and his ship, Odysseus had himself lashed to the mast after plugging his men's ears with beeswax. It worked, and they got safely by the Sirens, but Odysseus fought like a maddened beast against his bonds to get to the Sirens who would destroy him. For a time, pleiosaurs also abounded, giving rise to all the now controversial contacts with dragons. More pleasant, Greek landscape and seascape teemed with fair creatures called nymphs and resembling young female humans. Not so pleasant were goatlike satyrs which liked human females, dancing, and flute-playing, though it is not known in what order, since they did all three with equal zest. Perhaps the most charming and admirable was the one-horned horse, the Greek monokeros (unicorn). People prized not only the unicorn's beauty but the healing power attributed to its horn. Snake bite was cured by the unicorn's very presence, it is said. It is useless to speculate what happened to these and many more creatures, for whatever in truth they were nearly all of them disappeared not long after the onset of the Modern Era and are to be found in the Underworld, if they weren't first destroyed by the hand of man. Poets and writers continue to spread their beauty or ugliness, fame or ill-fame from one generation to the next. The Anakim, Zamzummins, Nephilim--families of giants descended from the intermarriages of Titans with human females; spread to other continents after Mukalia and Atlantis went down, they are now extinct. Giants terrorized human society in the Modern Period as late as the timspecies, sons and daughters of Lucifer, the only Cherub that produced offspring (doing so, asexually); noted for civilized arts, swiftness, and strength, but, not strangely, the Luciferan Titans proved fatally lacking in justice and morality though their intelligence and architectural gifts were unbounded. Rebellious in spirit, affecting neutrality when it actually cloaked self-interest, they separated their affairs from their Luciferan progenitor when universal conflict broke out in the War of Heaven. For a time, it seemed that neutrality and self-interest might save the terrestrial Titans, but a chief among them took sides with the losing faction. Because of that, most were drawn into supporting their Father, the rebel Cherub Lucifer. When he was thrown out of Heaven, they lost position with him and were confined deep underground on both Earths (by this time the twin Earths had Underworlds for such long-term confinements). Life, on the surface, went on. The remaining Titans, those who had not joined in the war, mingled with some tribes of the human race and constructed on both Earths the mother civilization of Mukalia. Called "incomparable," this civilization evolved, in the Twins' geologic time scale, late in the Pleistocene Epoch, or about 100,000 years B.C. There were two Mukalias--mother civilizations--one on each planet, but the Land Bridge made them one. Ruin came, however, when Lucifer, Prince of Earth, perverted the Mukalian Human-Titans. The Mukalian civilizations were finally eradicated. But giants survived their collapse. They were plentiful up to the time of Noah, when they were all destroyed in the Great Flood along with humanity. Until then they enjoyed great prestige and wealth, ranking with royalty in their privileges, which rather corrupted them. Though all were drowned or otherwise killed by lightning, the race wasw later birthed back into existence through the wife of Ham, whose parentage was probably contaminated with giant ancestry and interbreeding. 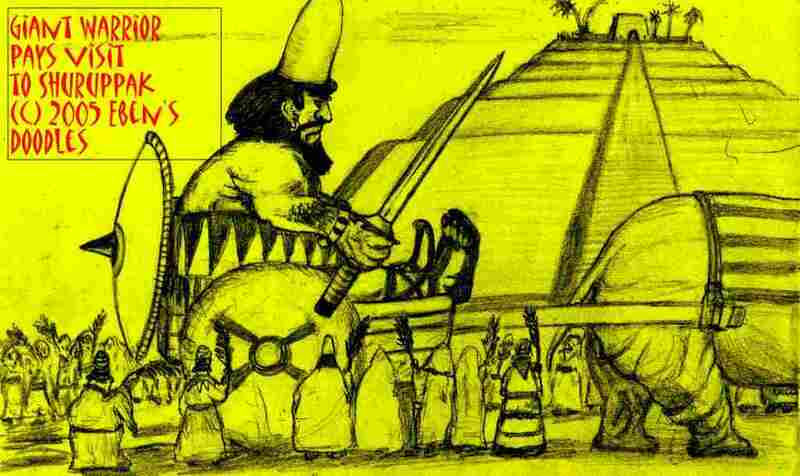 Such survived in human society as late as the time of King David of the Israelites in the 11th century B.C The giants continued huge and unwieldly in size, losing the advantage of swiftness after the decompression of Earth in the Great Mubbul. Og, King of Bashan, had a bedstead nine cubits long (or more than thirteen feet, if a cubit is eighteen inches). Hebron, perhaps Asia's earliest inhabited city, located in the mountains of southern Palestine, was first named Kiriath; later it became Kiriath-arba, for Arba the giant came to live in the city, and his name brought Kiriath both fame and protection. 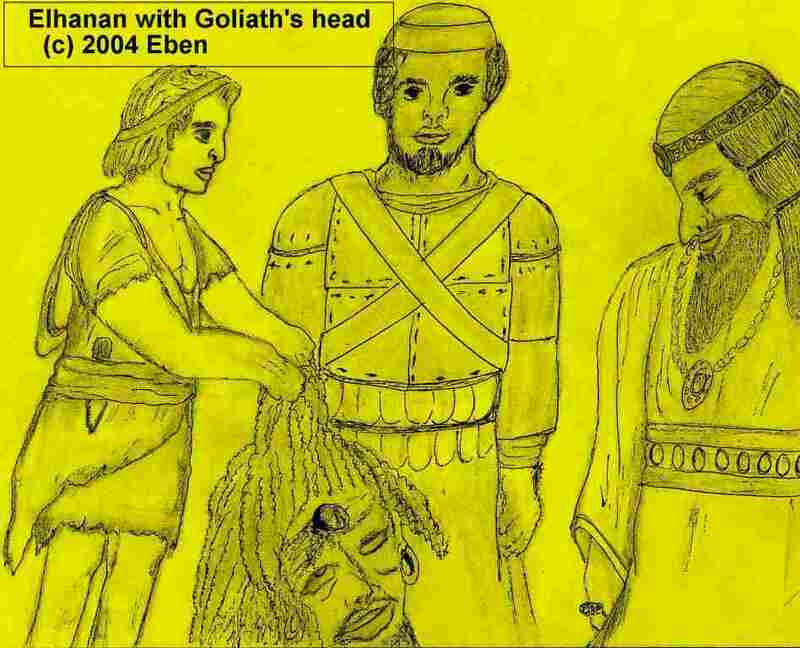 The stripling Elhanan (David) achieved immortal fame by killing Goliath of Gath. A champion of the Philistines, Goliath was large and powerful enough to have been a descendent of the Nephilim, and he had four brothers (the reason for Elhanan's gathering five smooth stones from a streambed for his sling). In Greek accounts we also find many giants at large, for though the Titans had left human history, giants were still very much alive in the earth. Theseus, who slew a bull-headed man called the Minotaur with his bare hands, drew and quartered the giant Sinis. This was appropriate punishment. Sinis was called the Pine Bender for his trick of drawing and quartering his victims by tieing them to pine trees he had bent to the ground. He got the best of another giant named Sciron by banging him over the head with his own footbath and then pushing him over the cliff edge. Sciron's speciality was kicking unwary people over the cliff to their deaths after forcing them to wash his stinking feet. A huge tortoise waited below for the victim, and Sciron, appropriately again, was its last meal. It is fitting that when the tortoise died, it in turn was devoured by this animal that is extinct now but was once fairly common in waste and wilderness places, where it utilized the rooting and scavenging abilities of a warthog and rat combined in one horrible beast. Post-Adamic--a rich brew of human, mutant, and sometimes zoomorphic races inhabiting Earth II; products of nuclear isotopes from an H-bomb blast in South America; dominant human and humanoid species on Earth II were Gypsies (human), dwarves (mutant human), superhuman "jaguar-men," and various tribal human peoples who possessed unusual healing powers; from all these post-Adamic races originated a new type of human being in the person of Quinn Ceylon the Bluebird, also called Star Boy because of luminous organs of sight in his hair, all eyelike in appearance but far more than a supplement to natural vision. He is immortalized in Earth II's night sky as the Bluebird Constellation. 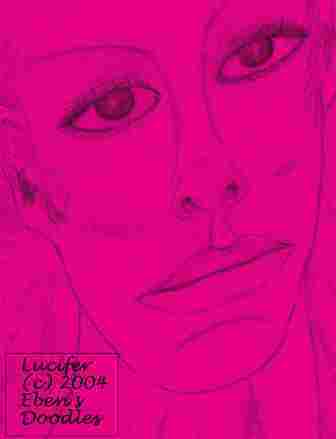 Lucifer is an alien entity, and technically still an archangel who was called the Covering Cherub, because he presided over the throne of God and the music. When he fell, he fell far, indeed, from this great eminence (though, again, he was restricted to only one of the twins, Earth I). Where did the Greeks (descendants of Japheth and Javan, descendants of Noah) get their extensive knowledge of monsters and giants if not from their own experience? By the time of the Classical Age, these had all been killed off in their territories, of course, but they lived on in lively accounts that were given immortality in classical Greek epics and plays. Emims, In the Semitic Eastern territories, the Anakim giants predated the Philistines by many centuries, for the Philistines were relative latecomers to the area, migrating down from Captorim (or Crete and possibly Caria and Lydia). 100,000 B.C.? * Mukalia destroyed-------------Garden of Eden---------------9,500 B.C. Noah and the World Flood--------------3000 B.C.? Tower of Babel/Confusion of Men’s Languages/Dispersion of the Human Race---------2000 B.C.? In the Chronicles, the B.C.-A.D. system is changed to A.A.S. and A.S., Anno Stellae (In the Year of the Star...), and Ante Anno Stellae (Before the Year of the Star). The Star is not only Yeshua Himself, who is the Bright and Morning Star, but His glory is a star that he left behind temporarily in heaven at the onset of the Incarnation.